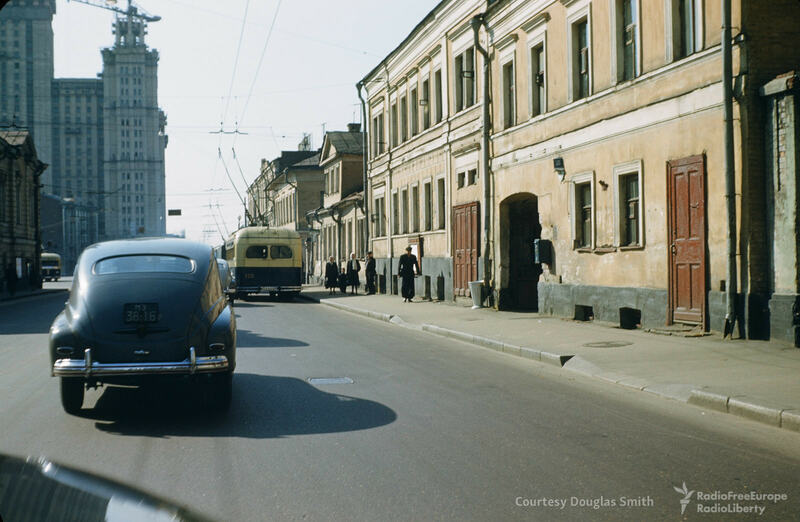 American historian Douglas Smith who specializes in Soviet history discovered a collection of photographs and videos in the home of Martin Manhoff, a US diplomat who served in USSR, that he took in 1952—1954. 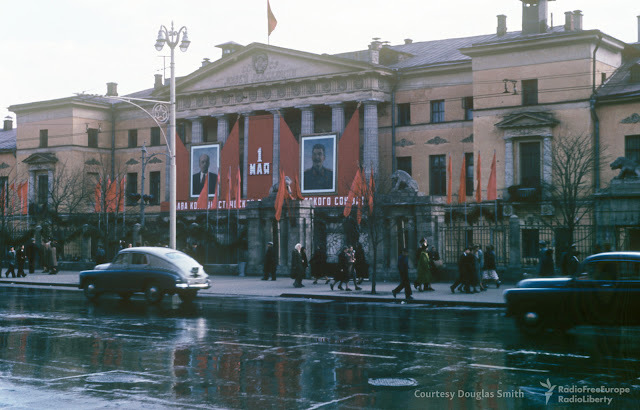 According to Smith, after Manhoff’s wife died he was asked to check the home of a former official for valuable memorabilia. “I was amazed at what I discovered. 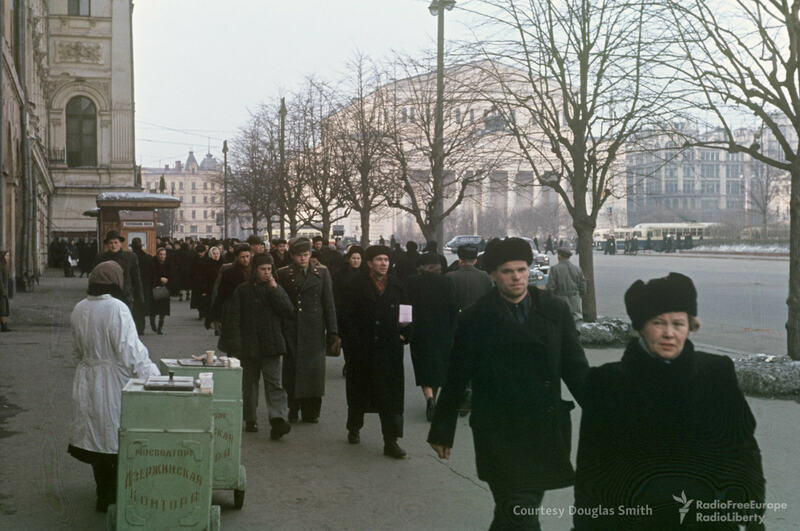 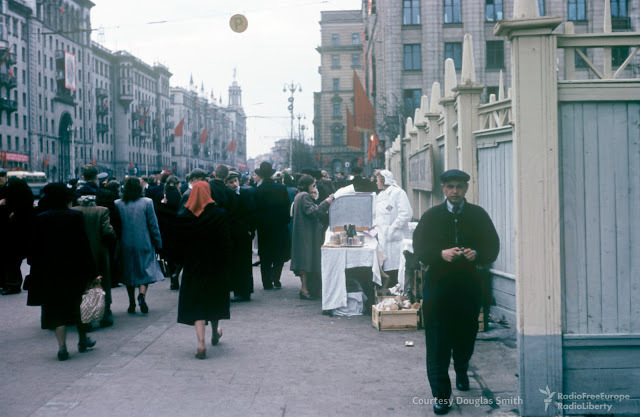 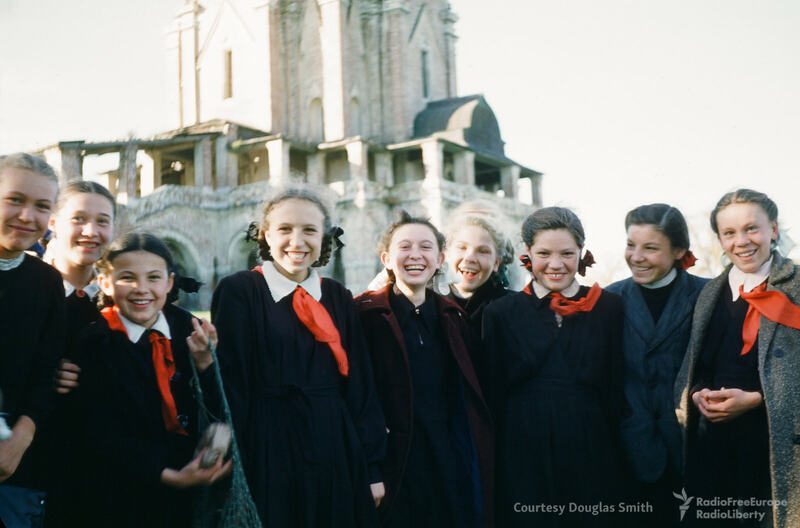 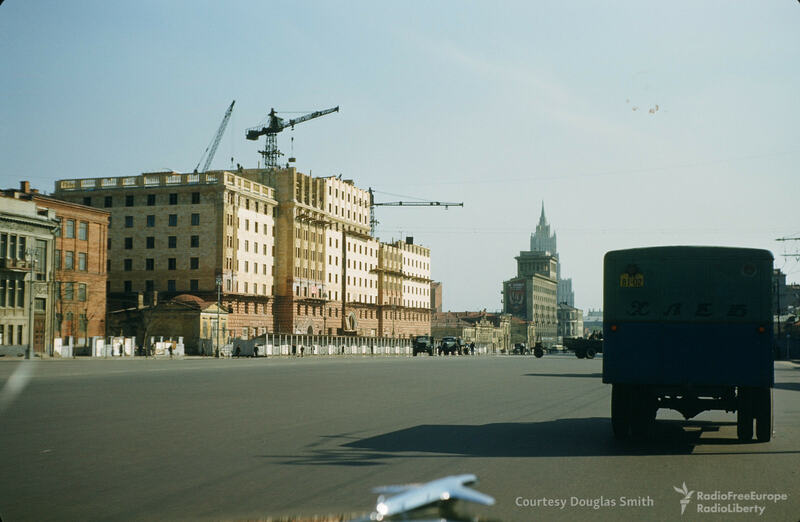 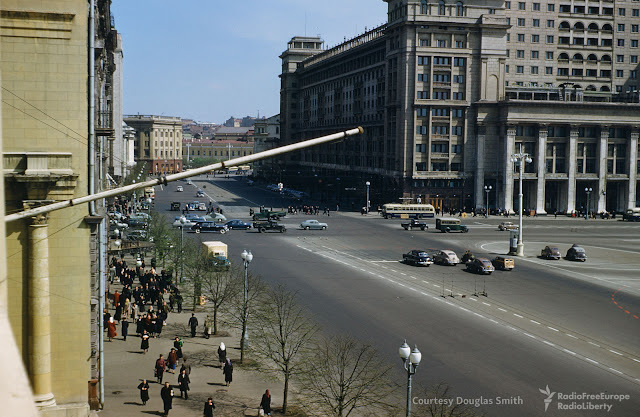 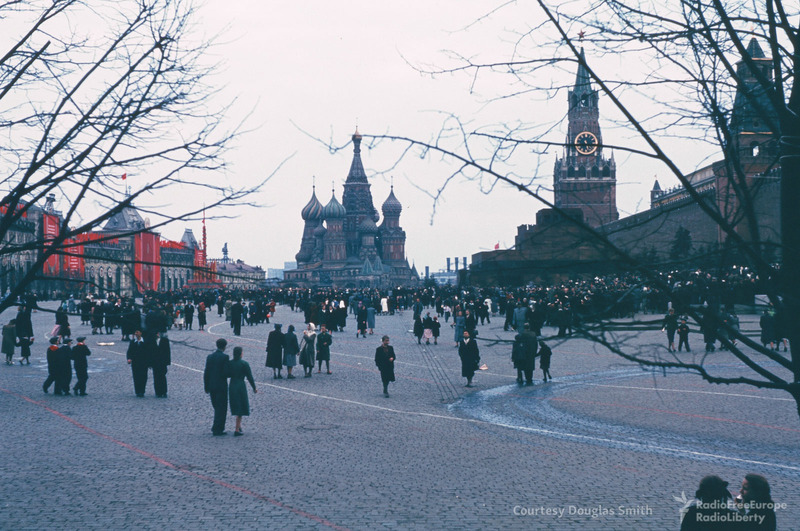 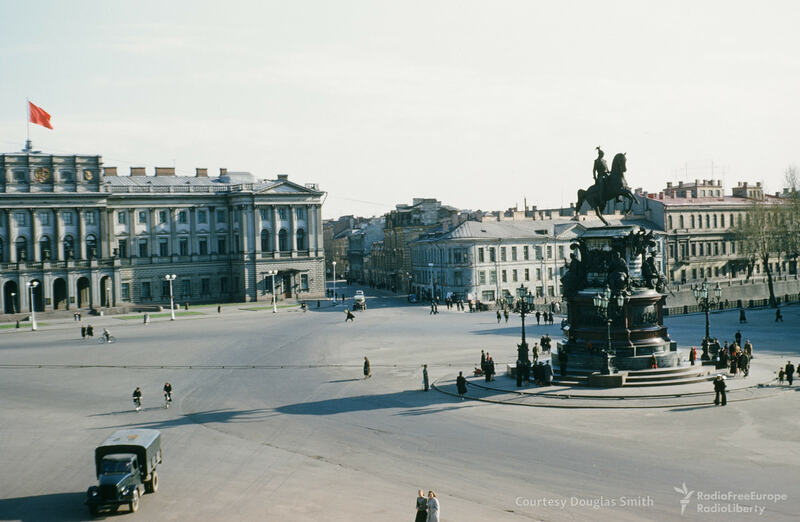 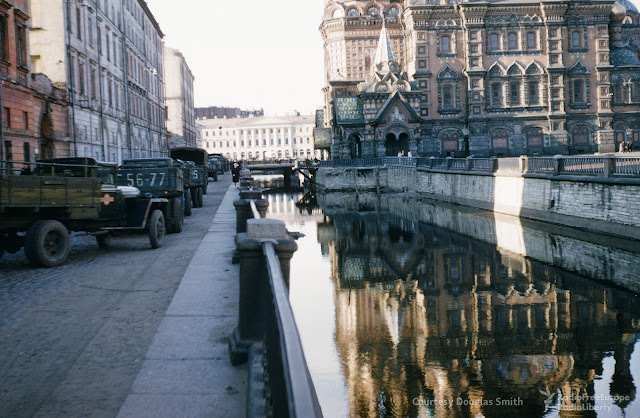 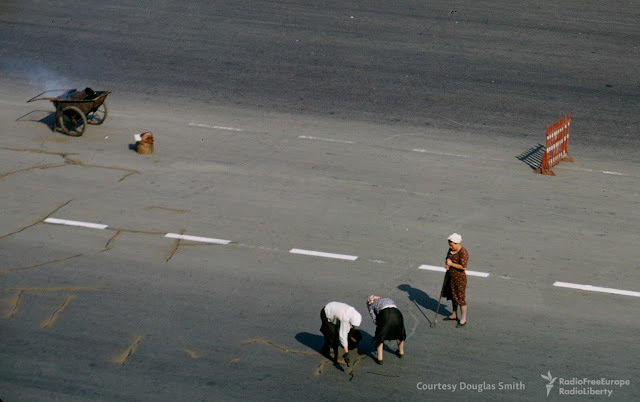 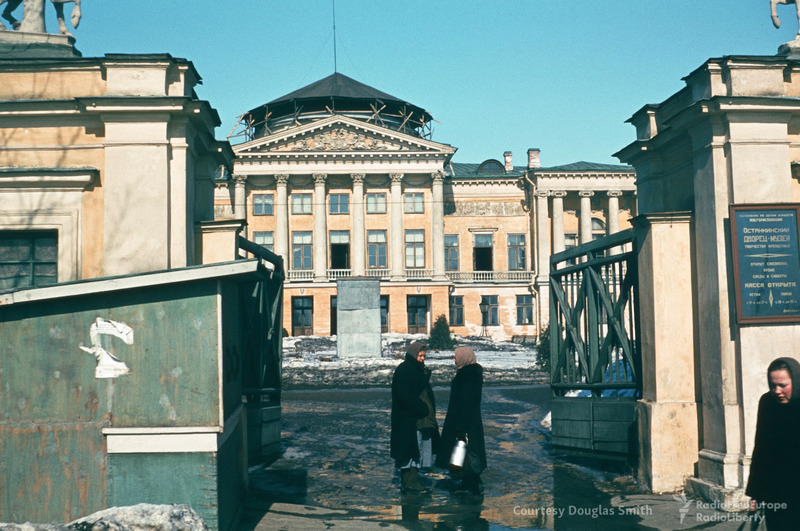 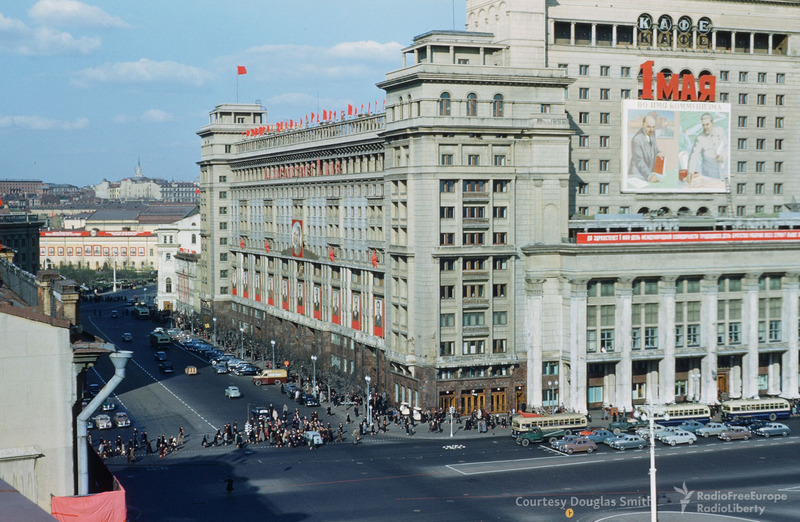 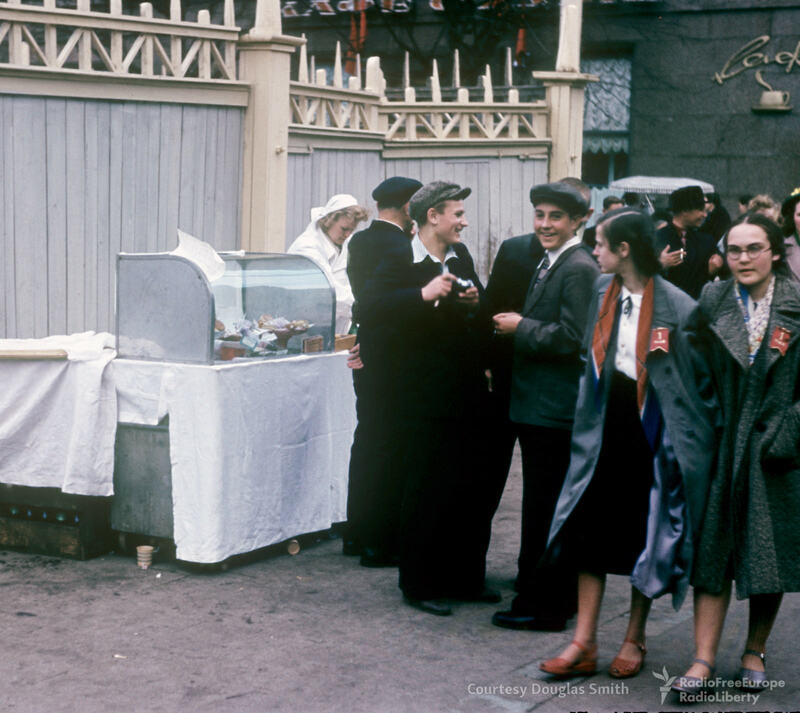 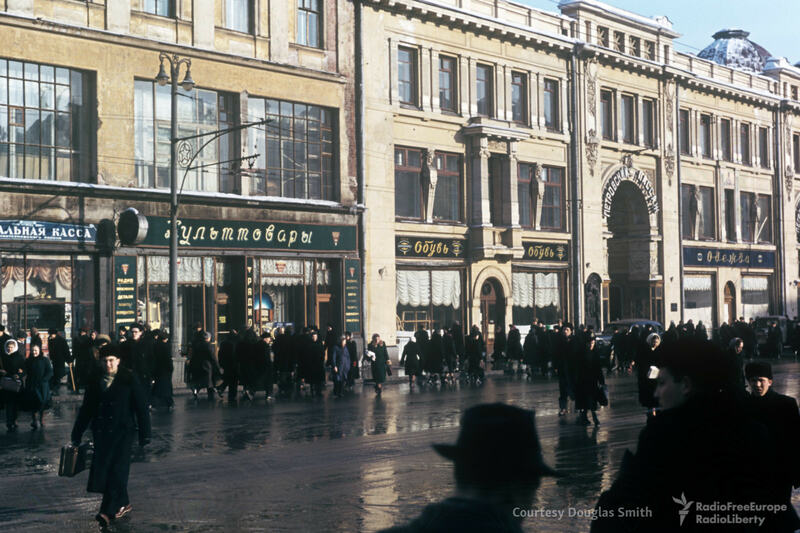 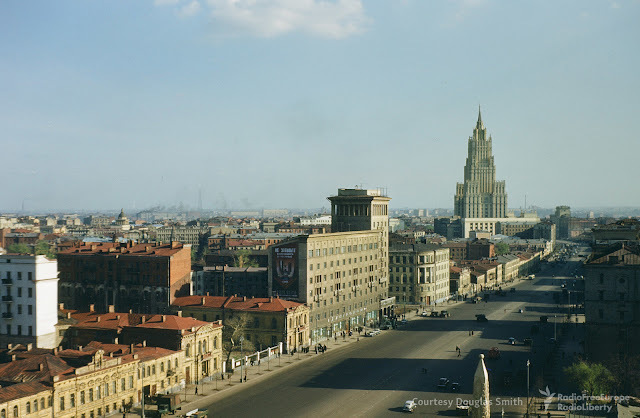 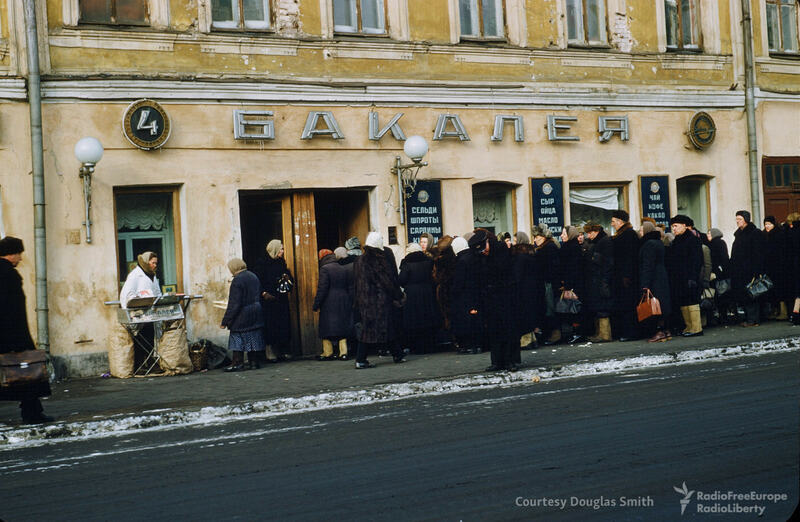 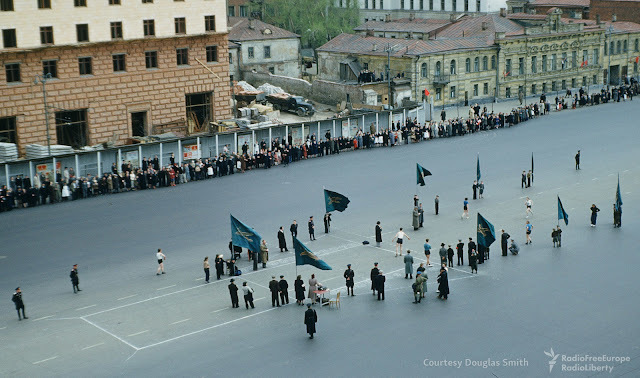 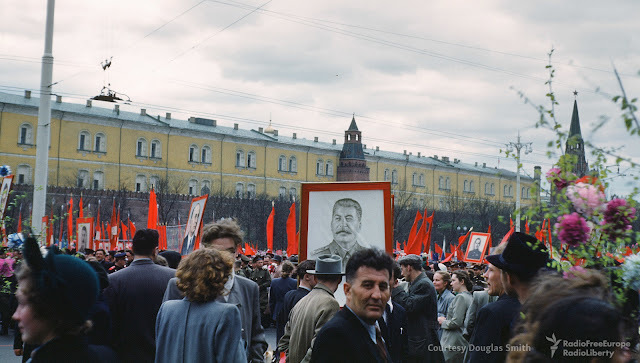 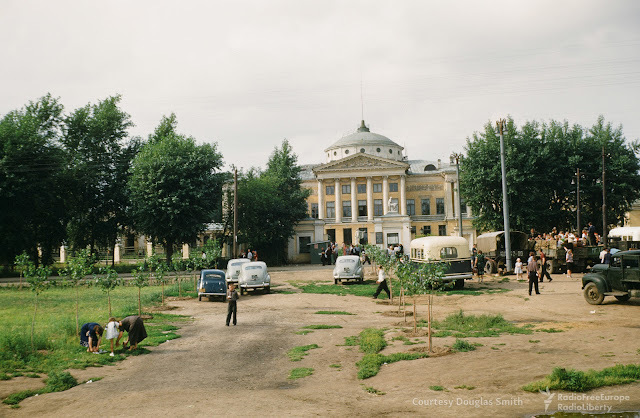 There are thousand of color photographs taken on the streets of Moscow, Leningrad, Murmansk, Yalta, and at points along the Trans-Siberian Railroad,” Smith says. 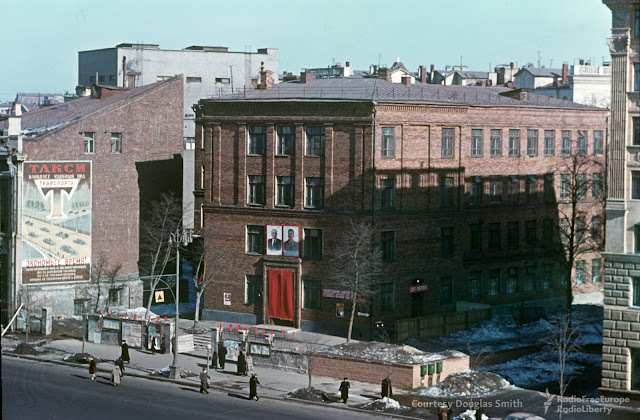 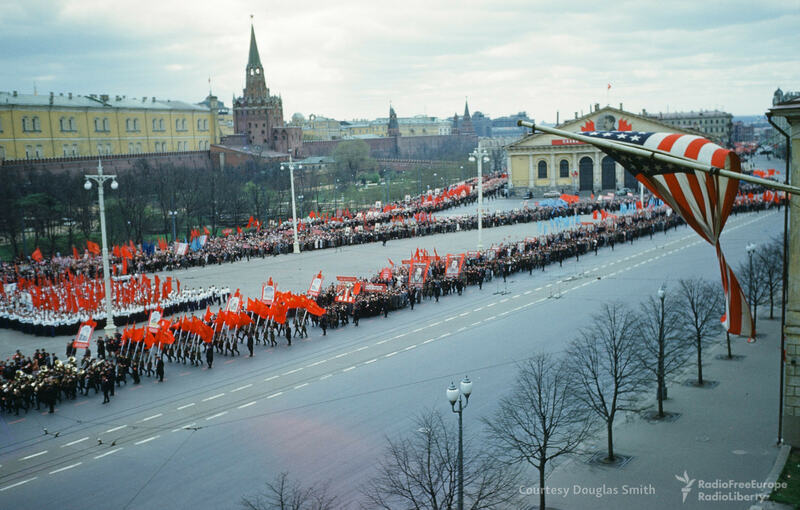 The archive also includes unique footage from Joseph Stalin’s funeral — it was taken from the window of the US embassy in Moscow, located in the Hotel National. 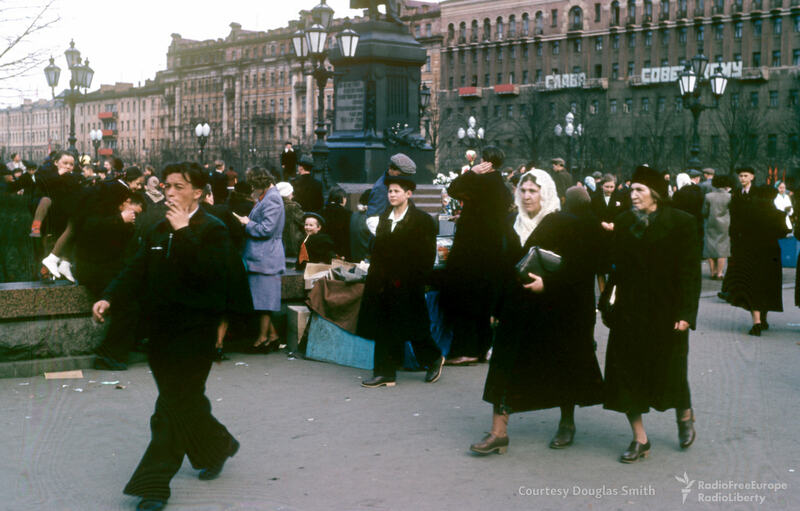 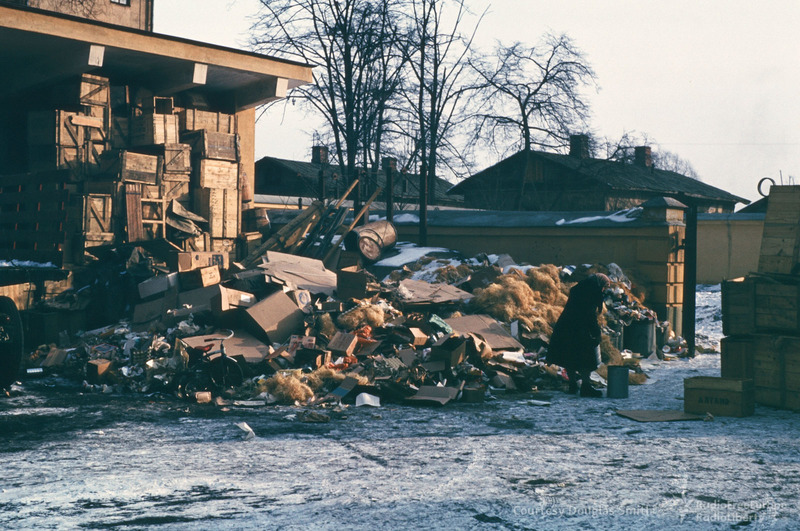 Whether shooting Moscow street scenes from a chauffeured car, or writing home about their experiences, Martin Manhoff and his wife Jan were piecing together an intimate, vivid portrait of life behind the Iron Curtain in the early 1950s. 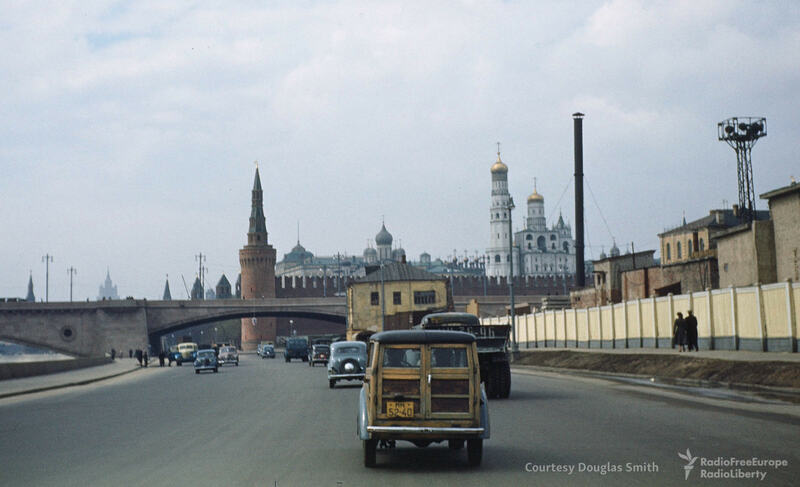 Approaching the Kremlin on Moskvoretskaya naberezhnaya, Moscow. Driving up Moscow's Bolshaya Nikitskaya ulitsa, with the Stalinist skyscraper on Kudrinskaya ploshchad rising in background. 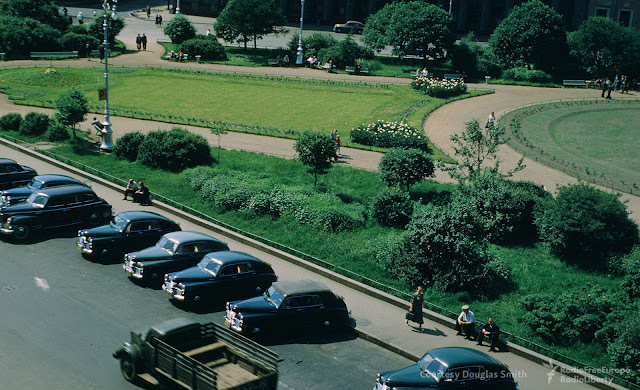 Driving down Novinsky bulvar, Moscow. 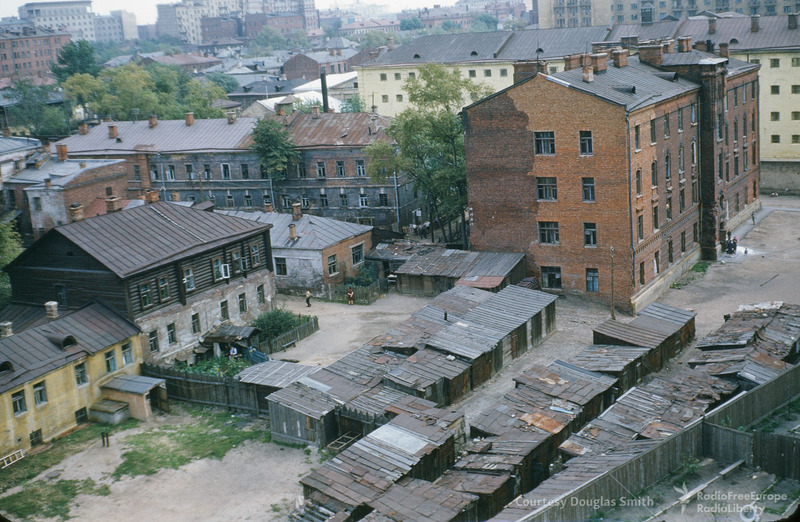 Log-topped housing and ramshackle sheds topped with corrugated steel in Moscow's Tagansky raion. The corner of Moscow's Bolshoi Devyatinsky pereulok and Novinsky bulvar, near the new U.S. Embassy opened shortly after May Day in 1953. 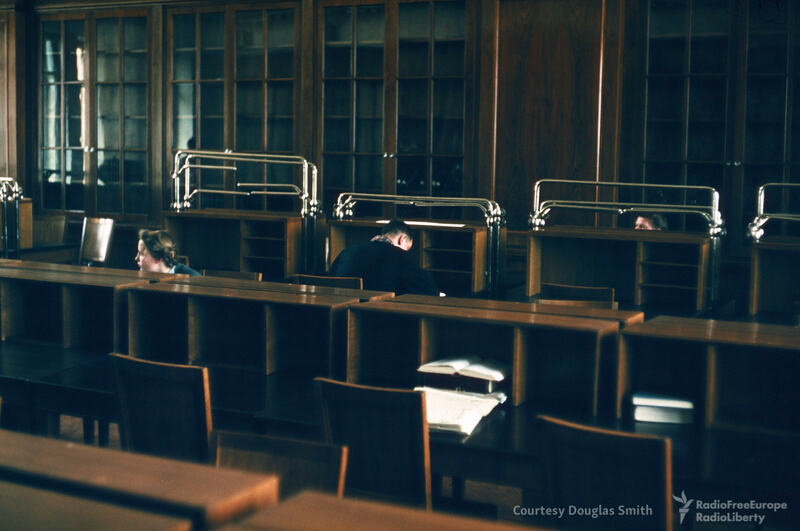 Reading room at an unknown location. 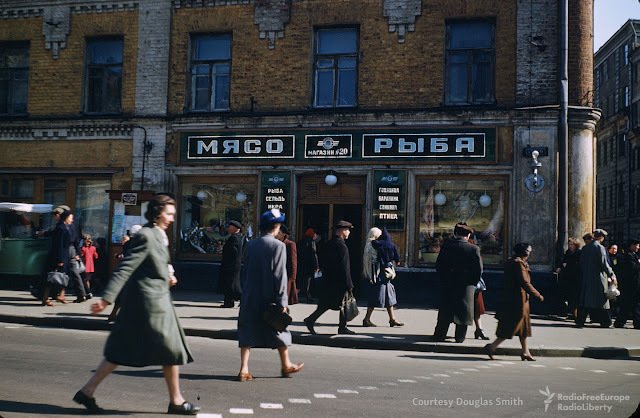 A street corner in central Moscow. The building has since been demolished. 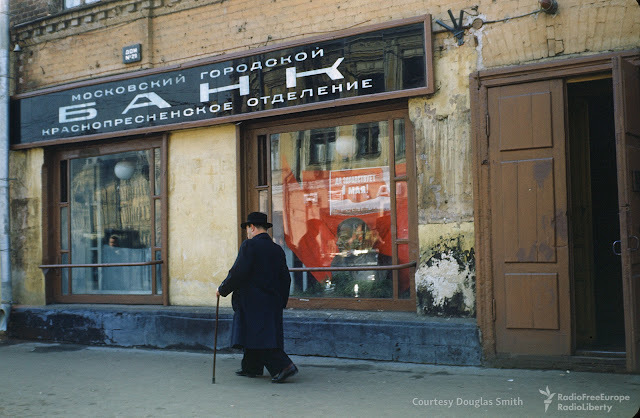 A bust of Lenin decorates a window of a Moscow City Bank branch. A street scene in central Moscow. People line up outside a grocery store at an unknown location. Road repairs on Novinsky bulvar, Moscow. 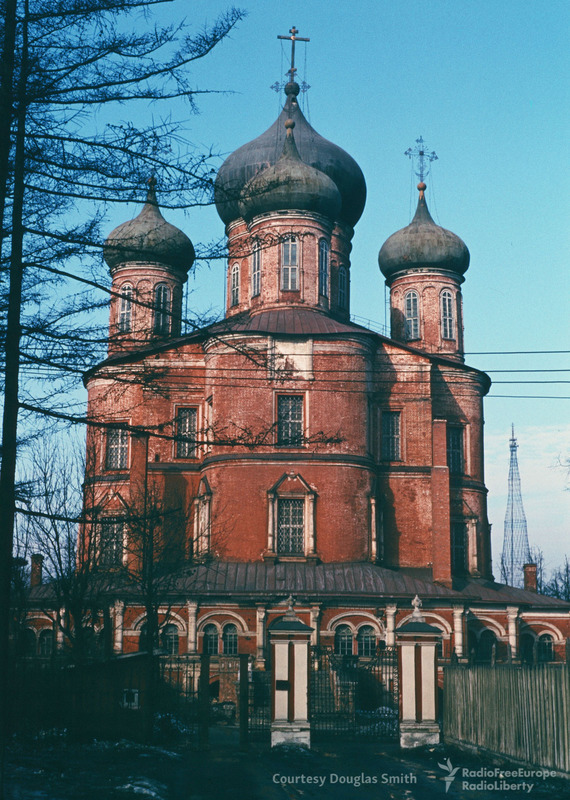 The steeple of Moscow's Novospassky Monastery, seen from a nearby street. 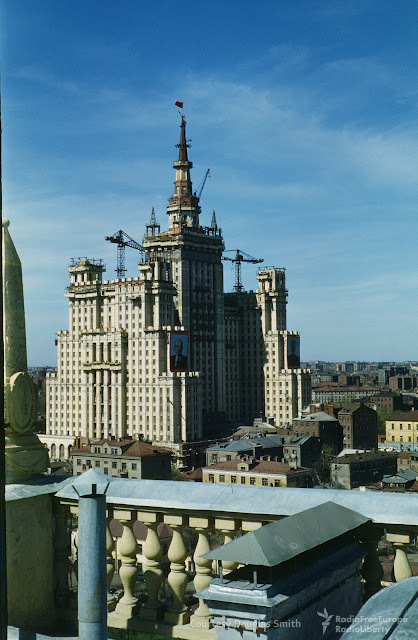 The finishing touches are put on the Stalinist skyscraper on Kudrinskaya ploshchad. Photographed from the roof of the new U.S. Embassy. 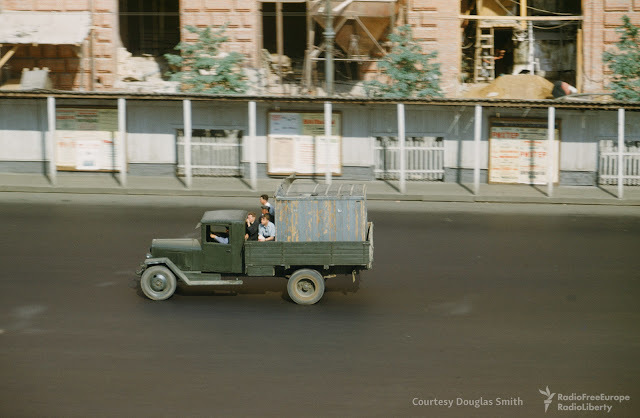 A truck rolling down Novinsky bulvar, Moscow. 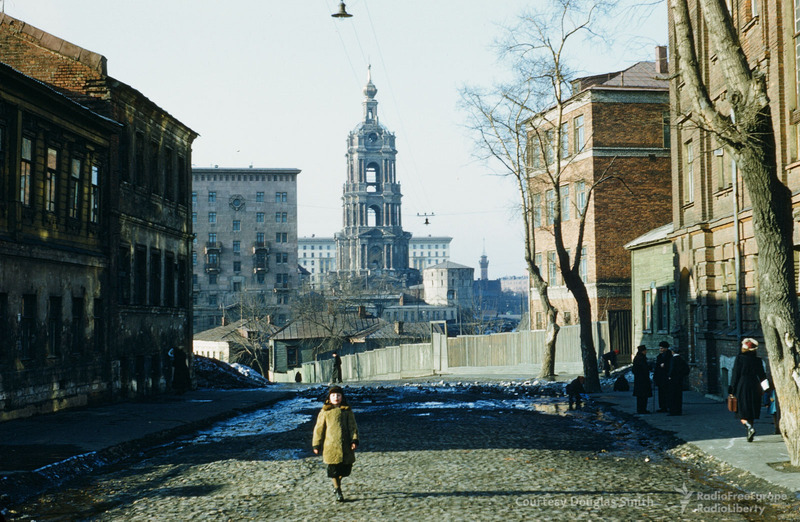 View of the Moscow Zoo with the Temple of St. George in the background. 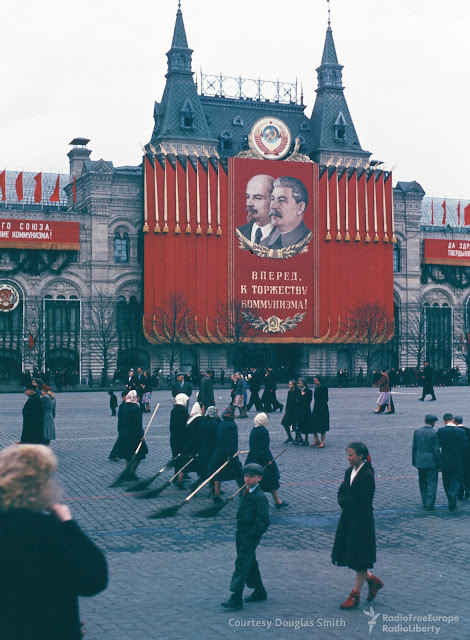 Streetcleaners wielding tree-branch brooms on Red Square. 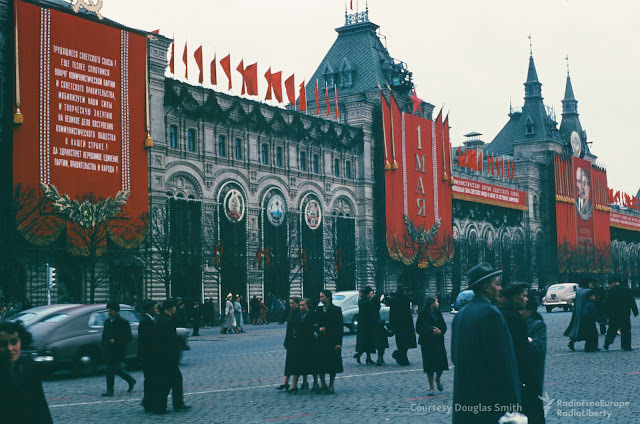 The GUM department store on Red Square. Trash piles up at an unknown location. 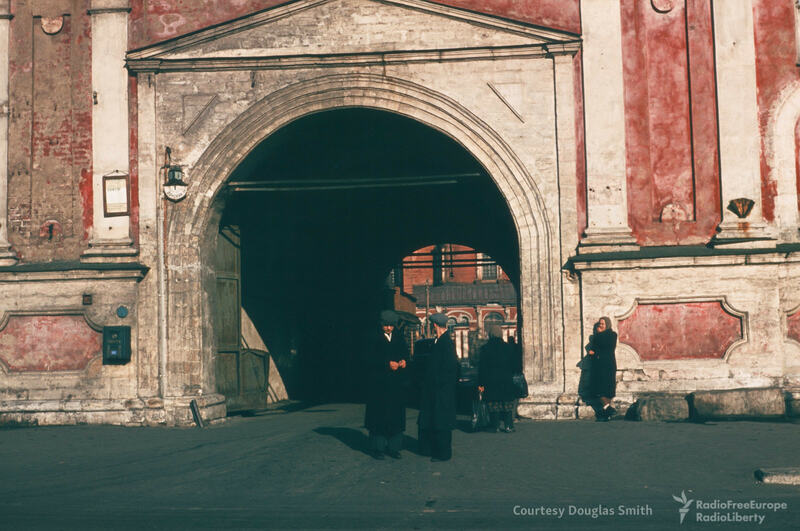 The entrance to Donskoy Monastery, Moscow. 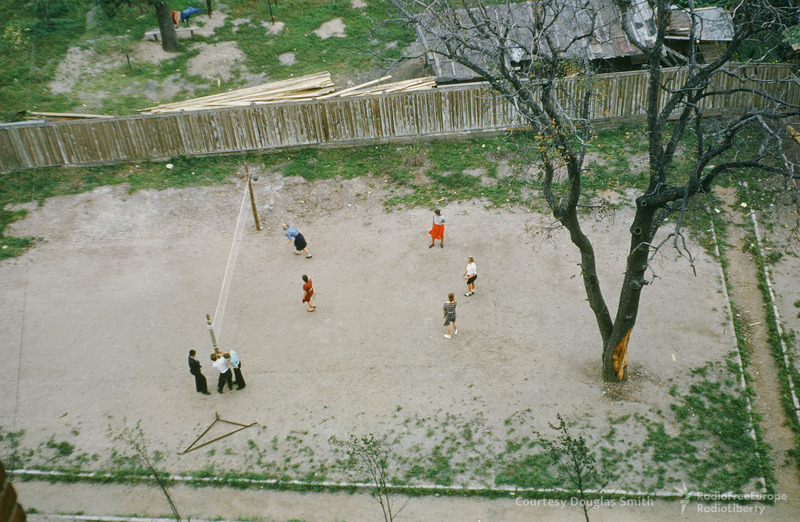 A one-sided volleyball match in Moscow's Tagansky raion. 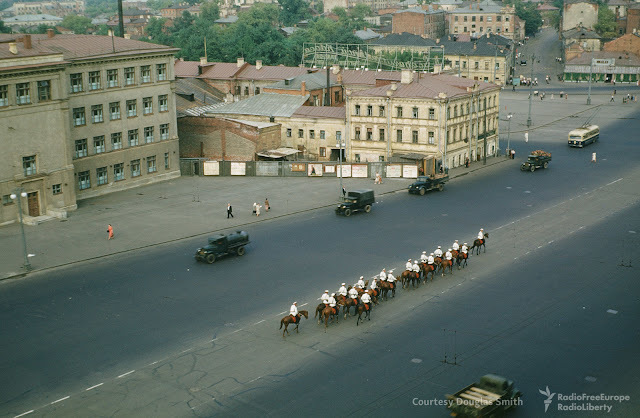 A line of horses take over the center lane, unknown location. 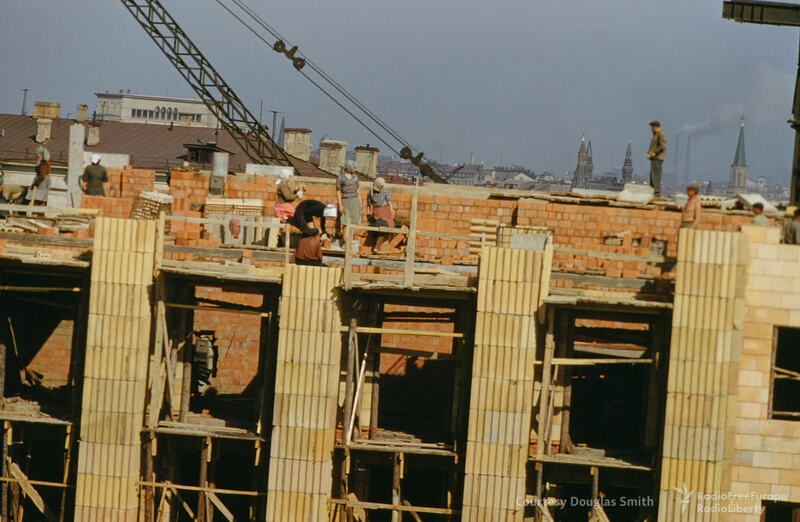 18 Novinsky bulvar under construction in Moscow. 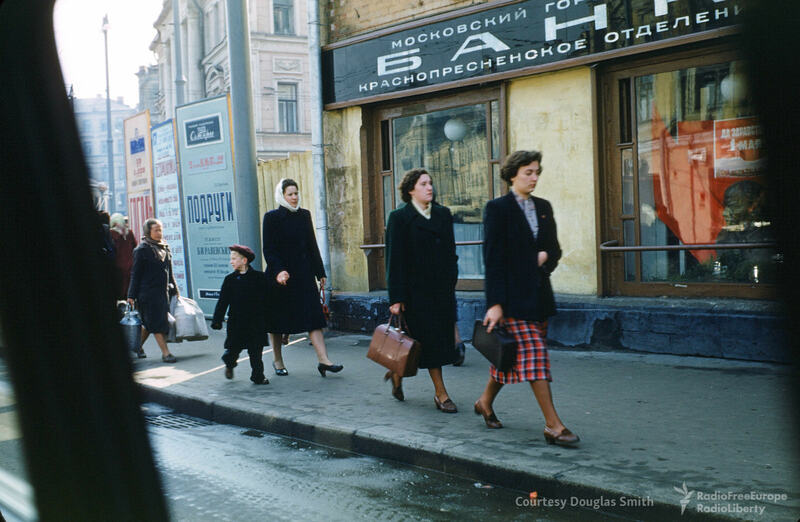 Schoolgirls visiting Kolomenskoye, a former royal estate in southeast Moscow. 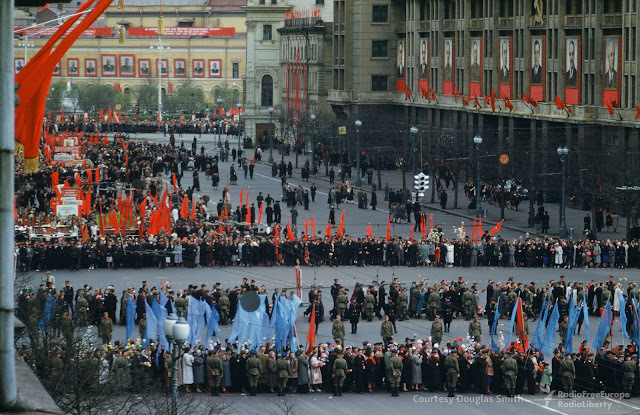 A parade on Manezhnaya ploshchad, Moscow. 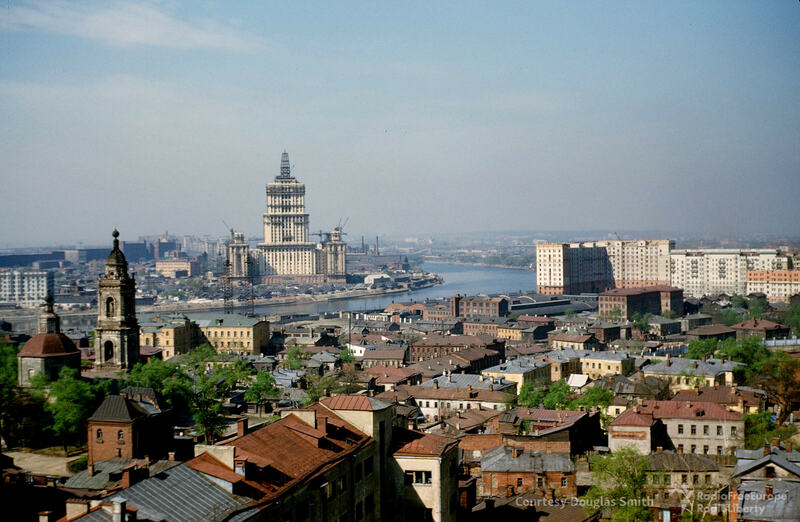 The Hotel Ukraina skyscraper as seen from the roof of the U.S. Embassy on Novinsky bulvar, Moscow. To the left is the Church of the Nine Martyrs of Cyzicus. 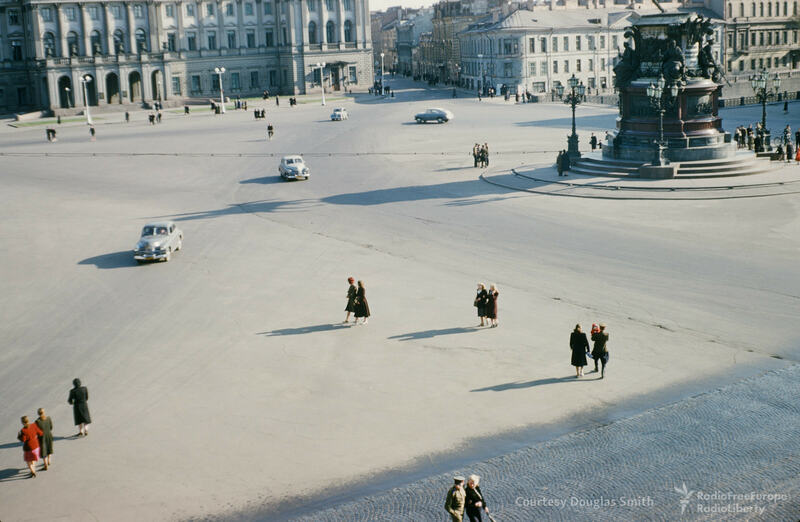 Looking down Novinsky bulvar, Moscow. 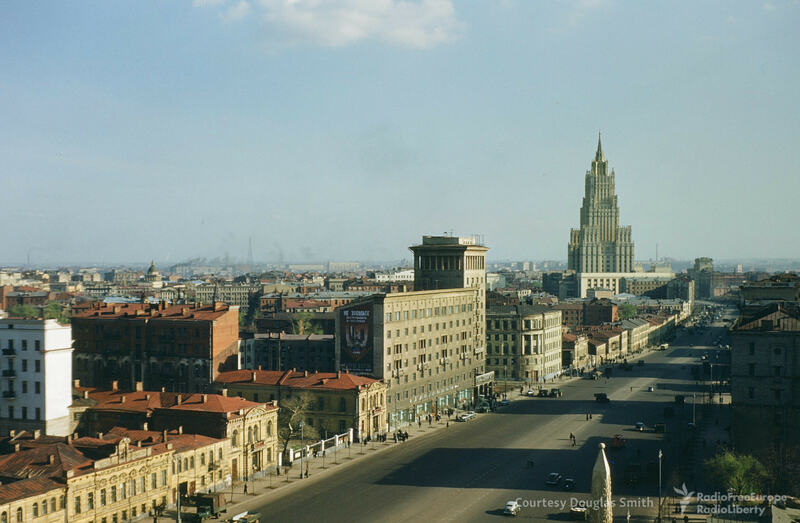 The skyscraper houses the Foreign Affairs Ministry. Young Pioneers march in formation down Manezhnaya ploshchad, Moscow. The Hotel Moskva, on Manezhnaya ploshchad. 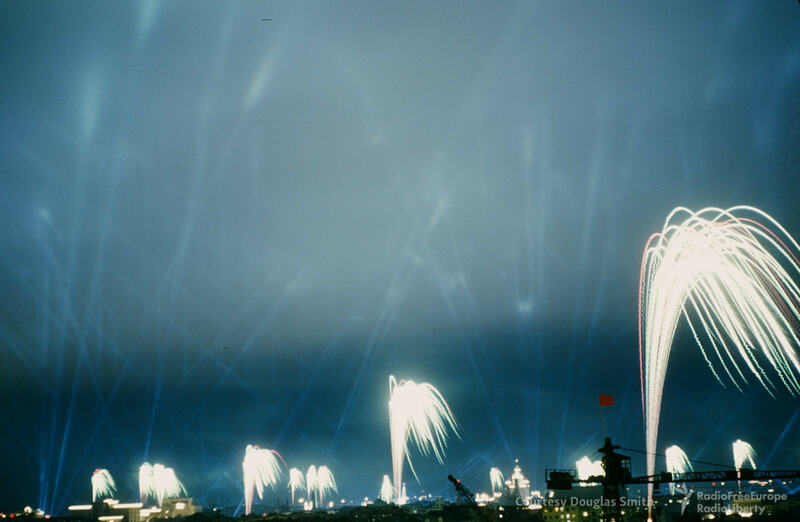 Fireworks light up the Moscow skyline. 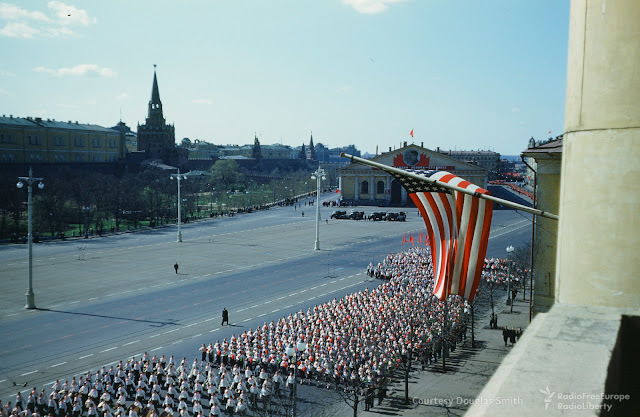 A parade in front of the former U.S. Embassy building on Manezhnaya ploshchad, Moscow. A relay race on Novinsky bulvar, Moscow. Small cakes being sold on May Day on Tverskaya ploshchad, Moscow. 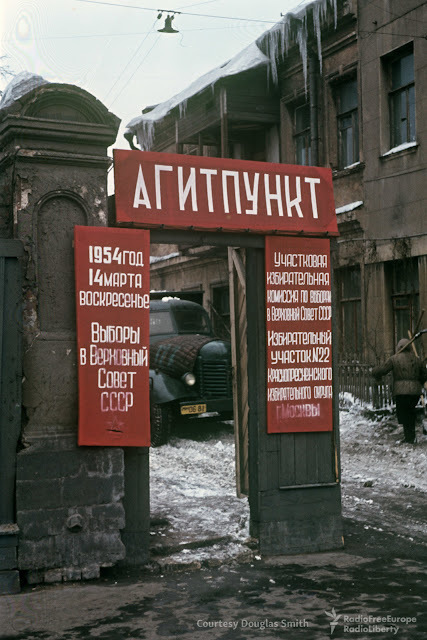 A propaganda station at an unknown location. 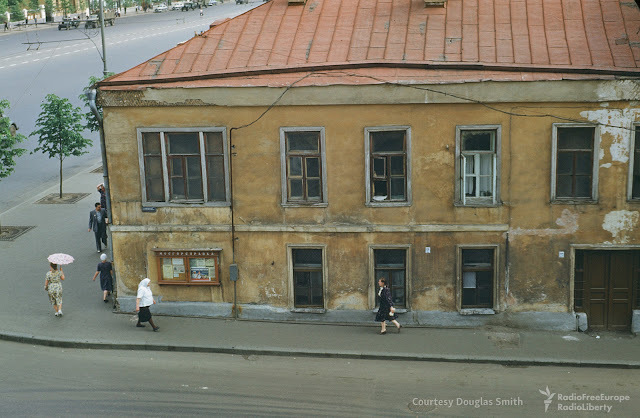 Buildings opposite the new U.S. Embassy on Novinsky bulvar. 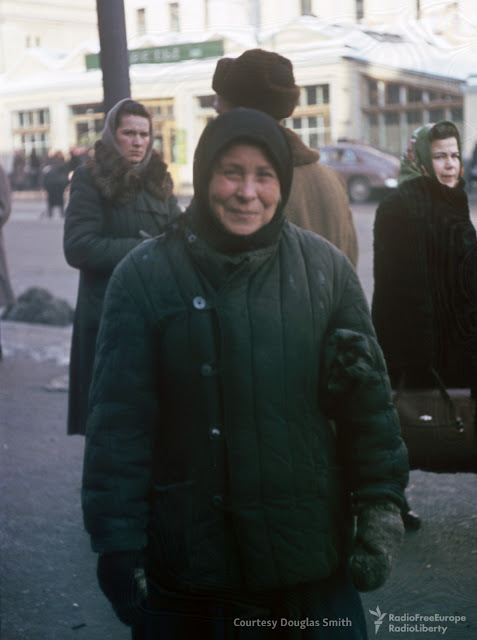 A woman poses for a portrait opposite 14 Petrovka ulitsa, Moscow. Petrovka ulitsa and the entrance to Moscow's Petrovsky Passazh department store. The State Central Museum of the Contemporary History of Russia, on Tverskaya ulitsa, Moscow. 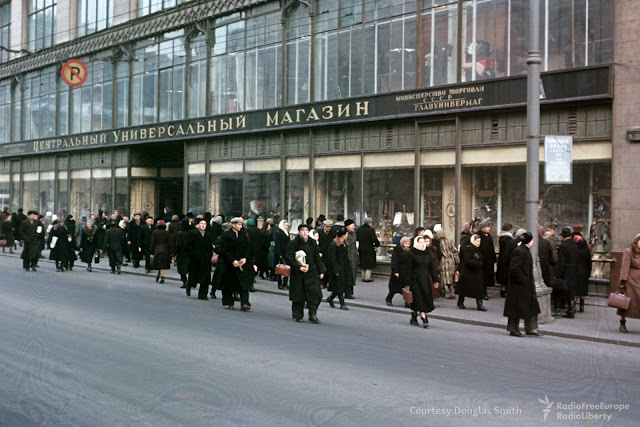 The TsUM department store, on Moscow's Teatralnaya ploshchad. 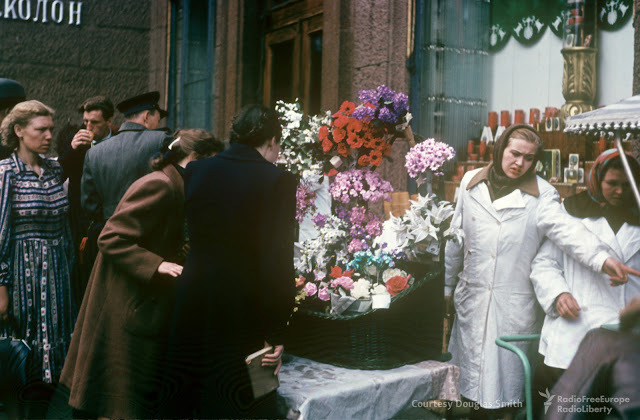 A flower seller at an unknown location. 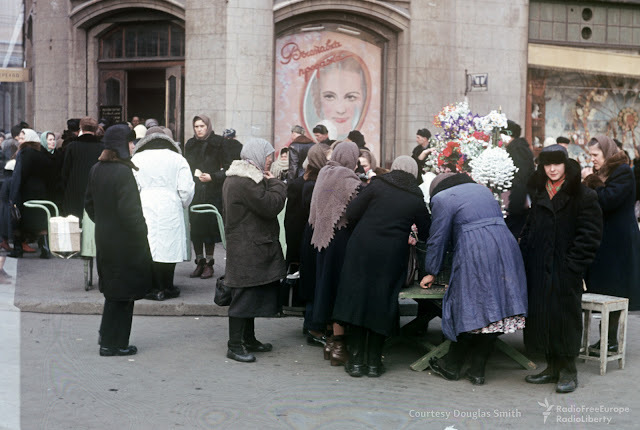 A crowded flower stall on Teatralnaya ploshchad, just steps east of the Bolshoi Theater. 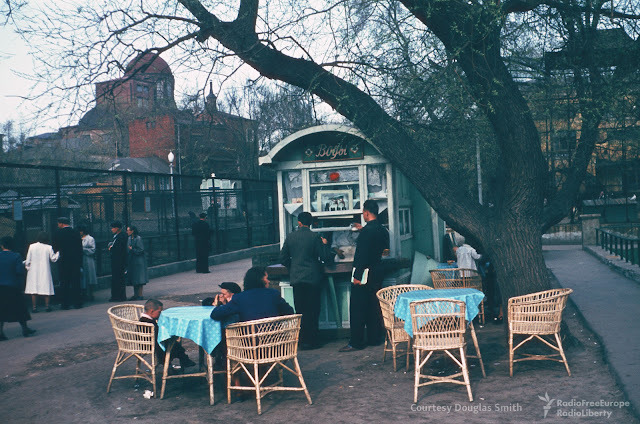 An ice cream stall on Teatralnaya ploshchad, Moscow.